truth be told, this is one of my favorite yearly blogs to write. this is when i go through all my organized baseball stuff and tally up my personal numbers for the Cleveland Indians season. i love to see everything that i accomplished during the year. like always, i collected some player autographs, acquired a few baseballs, and took a multitude of pictures and videos at the games i went to. and because i got a new digital camera with 30x zoom and invested in a larger SD card, i was able to capture even more/better quality pics than ever before. i like to take as many pics as possible since i can't watch my boys on TV unless they're on a national channel due to STO being blacked out on the MLB package in my area. these mementos also help lessen my rage over the fact that i live 2 plus hours away from the 216 and can't go to the ballpark as much as i want to. in true diehard fan form, i spent the entire year, from the beginning of the offseason straight through to the end of the season, engrossed in Indians baseball and Michael's season. 2015 represented the 5th straight year when i didn't miss one out of one inning of one game in real time. once again, i was present for all the Tribe's preseason games and all the 161 regular season games. (i can never say "watched" since i listen to the games on my laptop.) i surprised myself because i really believed this was gonna be the year i'd end my run and miss some games due to life getting in the way. as luck would have it, that was not the case. i managed to set up everything that i needed to do, appointments and such, around the Indians' schedule to make certain that i would not miss any part of any game. i was present for all of Michael's plate appearances as they took place, writing down the results, and blogging when necessary. you know, the usual. but the streak might actually end here. it's not likely that i can arrange my schedule around another baseball season in 2016. i will literally be amazed if i can do 6 years in a row. that's why i'm so grateful to have done it just for these last 5 seasons. regardless of how the games turned out and what happened, of course i stuck it out. and i have no regrets because i'm Ride or Die. i have one last thing to address before we get into the final numbers. i have never been shy about admitting that i do not have good health. typically, each year i tend to miss at least 1 game i planned on going to, if not more, because i wind up too ill to make the trek out to Cleveland. and as expected, i did deal with a few health problems during the 2015 baseball season. yet somehow, the timing wasn't too damaging because i made it to every game i intended to see! it's a miracle! there was one game when i did not feel my best, but i was in no way ailing enough to refrain from attending. therefore, in total, i went to all 13 games that i picked to go to. except, i only ended up seeing 12 games. yes, that is correct. this year it wasn't my health that deprived me of 1 game; it was *gasp* Mother Nature. on September 12, the Indians were scheduled to play the Detroit Tigers at 7:10 pm. their previous matchup the night before was rained out and was to be made up as a doubleheader on September 13. inopportunely, the weather for the 12th actually looked worse than it had been on the 11th. when checking the hourly forecast online, i saw rain at practically every hour from 4 pm until after midnight. we drove from NY to Cleveland in off and on rain, so i was definitely skeptical about the game starting on time, if it even started at all. the gates opened at 5 pm, but we got there before 4 and waited outside, as per usual. a quick shower passed as we were waiting. then at about 5 minutes to 5, it began to rain lightly again. by the time the Progressive Field whistle blew, i was wet, my ticket was wet, my backpack was wet, the Terry Francona scooter bobblehead boxes were getting wet, and i was agitated. so generally once i'm inside the ballpark, i head down to my seat to watch Indians batting practice, take pictures, and try to get a baseball. but because of the rain, the tarp was on the infield and there was no bp outside. so my parents and i decided to go to the Team Shop and then walk around to kill time until we heard any updates. i constantly refreshed the Tribe's twitter account, which kept insisting that the game would be starting on time even though it was still raining and the tarp remained on the field. at approximately 6:40 pm, Bob Tayek got on the PA and announced that we were in a rain delay as rain continued to fall. after some deliberation about what to do, my parents and i found open seats behind Section 172 for us to sit in to keep us dry while we waited for further updates. i had my portable radio with me, so at 7:10 pm, i turned on WTAM 1100 and listened as Tom Hamilton said we were "in for a long night of waiting" because the Indians and Tigers had no mutual off days the rest of the season. and with a doubleheader already scheduled for them the following day, they really wanted to try and get the game in on this night. i didn't think the outlook was good however because the hourly forecast from weather.com showed persistent rain at every hour until 2 am. the rain began to lighten up around 9 pm, but the grounds crew was nowhere to be found, the outfield grass was soaked, and there were visible puddles on the warning track. if they were going to try to play ball, it was still gonna be a while. then around 9:30 pm, Terry Francona and Chris Antonetti came out onto the field to check its conditions, particularly in the outfield. Antonetti was on his cell phone, i assume talking with someone from WKYC Channel 3 news to get a weather update. i remember this routine during a game that was delayed due to rain back in 2013, and shortly after that we had gotten word that the game was soon to start. so i knew a decision would be coming before long. sure enough, not even 10 minutes after their walk-around, Tayek announced that the game was being postponed due to rain and poor field conditions and they had no makeup date yet. it was the first time i'd ever been to a game that was delayed and eventually postponed. as we left the ballpark, there was just a slight rain falling. to not waste the entire trip, we chose to go to the Horseshoe Casino for a little bit before heading home. we probably weren't there for much more than an hour before my father wanted to leave. funny thing is, it didn't rain at all as we left or on our drive back to NY. but that field was undoubtedly going to need the overnight hours to dry up some. 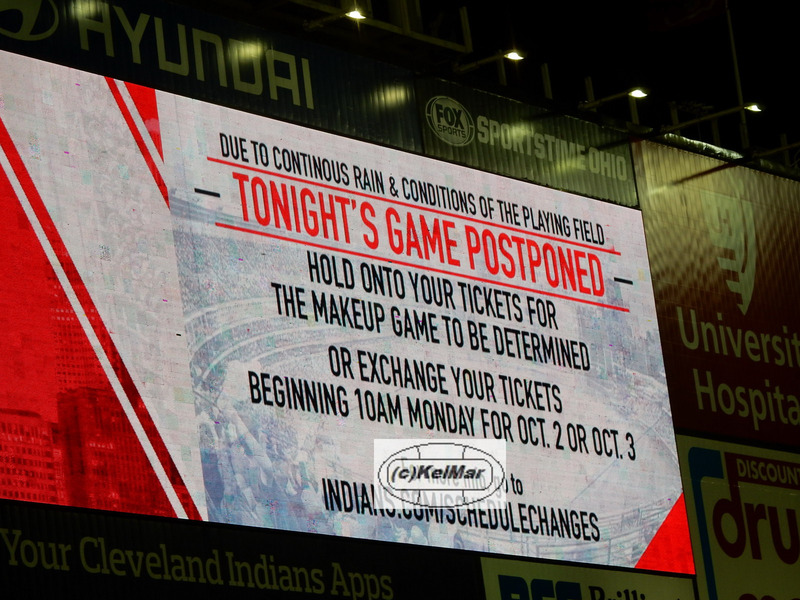 maybe a week or so later, the Indians finally divulged the makeup date--October 5. but there was one stipulation. this game would only be played if it was going to have any postseason implications. otherwise, both teams were going to have a 161 game season. knowing that the Tigers had no chance of getting themselves into the playoffs or potentially knocking another team out of them, they weren't the X factor here; the Indians were. they still weren't out of the wild card race, plus they were scheduled to play the Minnesota Twins, another team also fighting for the 2nd wild card spot, in 2 separate series. so this certainly made the final 3 weeks of the season very interesting. sadly, after the games on October 1 were complete, the Indians were officially eliminated from postseason play. that meant the September 12 game would not be made up after all, hence me only seeing 12 games this year. bright side, at least the money spent on those tickets was reimbursed to us, so we didn't get screwed out of $182.50. i went to 13 games this year, a new record for me. --however, 1 game was postponed due to rain and not made up. as explained in detail above, i still traveled to Cleveland for it though, but only actually saw 12 games (which is still a record for me). i took 11,535 pictures, clearly a new record as well. --including pre-game ceremonies, batting practice (but no BPX), player warm ups, the actual game, and of course parking lot. --he played in 8 of the 12 games i saw, missing 1 because of his lower back strain, getting 1 day off, and missing the last 2 at the end of the season because he was already shut down due to right shoulder inflammation. --normally i've always taken videos with my SONY Bloggie Touch camcorder, but since i had more space and better zoom on my new digicam, some vids were taken with my Nikon Coolpix S9700 and all were uploaded to my youtube channel. --i got 36 autographs, but 1 was from a Twins' player due to my father not listening to me, ripping the Batter Up! outta my hand, and attacking Kennys Vargas for his auto. ick. as the seasons go by, i find it becoming more and more difficult to get players' autographs, especially before games. in fact, none of the player autographs i got in 2015 came during player warm ups before the game along the 3rd baseline. what i began to observe last season has basically become commonplace now--players just do not sign in front of Section 171 anymore. maybe the tarp being there has something to do with it, but that was never a deterrent prior to 2014, so i don't understand it. once again, the hot spot sections were 167 and 169, and sometimes the right end of 170 at the edge of the tarp. coming into this year, i kinda figured pregame autos in my favorite section might not happen. last year pretty much prepared me for that. i just wish the ballplayers would spread themselves out more and give some love to the people behind the tarp and beyond towards the left field corner. don't leave us out! is it possible that they did sign for fans in those areas at the 69 home games i didn't attend? maybe, but it's funny that no one would sign at least once when i was there. so i don't buy it. thankfully, i had better luck after games in the players parking lot. yes, there were the usual "stick in the muds" who wouldn't sign postgame, like Michael Bourn, Nick Swisher, Corey Kluber (which bummed me out), David Murphy, and Brandon Moss to name a few. but on the contrary, some players signed quite often when i was there, such as Trevor Bauer, Francisco Lindor, Cody Allen, and Carlos Carrasco. heck, even the 2 Michael Brantley autos i got this season came at the parking lot. bear in mind, i obviously did not go to the parking lot after every home game. i didn't even go after every game i went to this season. but regarding the guys i said i never saw sign, some other parking lot regulars confirmed to me that they'd never seen those players sign either. i unfortunately and regretfully didn't get so much as 1 autograph from Nick Swisher, Michael Bourn, David Murphy, Brandon Moss, or Marc Rzepczynski before they were traded. for those players who were with the Indians for more than 1 year (which is everyone except Moss), it's unacceptable that i never got their auto considering how many games i've been in Cleveland for over the past 3 years. honestly, it's a shame. now that it's all said and done, i can confidently say i had a great season personally. i took a lot of awesome photos and videos that i can look at and watch all offseason to help me get through my Tribe withdrawal. i also have some nice autograph stories to reflect back on. not to mention every time i think about my encounter with Michael's dad, Mickey Brantley, i can't help but smile. that was a memorable day. thanks to him and of course all the Cleveland Indians for providing me with lots of special memories. here's hoping we can play some postseason ball next October! #RideOrDieTribeFan forever.